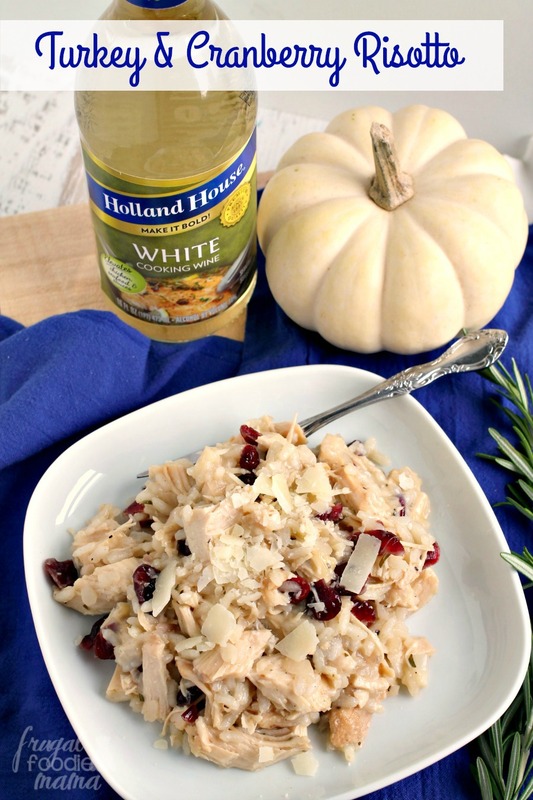 This post was created in partnership with Holland House Cooking Wine. As always, all opinions & thoughts expressed below are 100% my own. The only thing I love more than a good home-cooked holiday meal is the leftovers. But after a day or two of eating leftover turkey sandwiches, I am ready to change it up a bit. This Turkey & Cranberry Risotto recipe I am sharing with you all today is going to elevate your holiday leftovers to a whole other level of deliciousness thanks to the bold flavor that the Holland House White Cooking Wine adds to this dish. 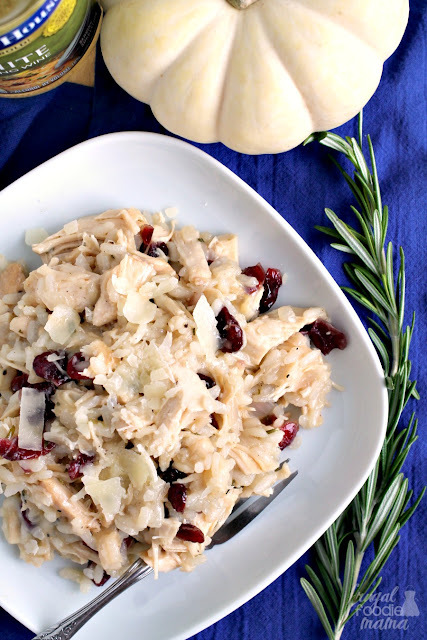 Creamy risotto comes together with fresh rosemary, leftover holiday turkey, sweet & tart cranberries, and flavorful cooking wine to create a dish that is almost as good as the holiday dinner itself. It is perfect post-holiday comfort food, you all. I will be the first to admit that making risotto from scratch is not necessarily a quick & easy dinner solution. It is a little bit of a labor of love, but it is well worth it for the final dish. From the aroma of fresh rosemary filling the kitchen to the transformation of the arborio rice into a creamy, sophisticated comfort food, this Turkey & Cranberry Risotto is definitely worth spending a little time in the kitchen for. 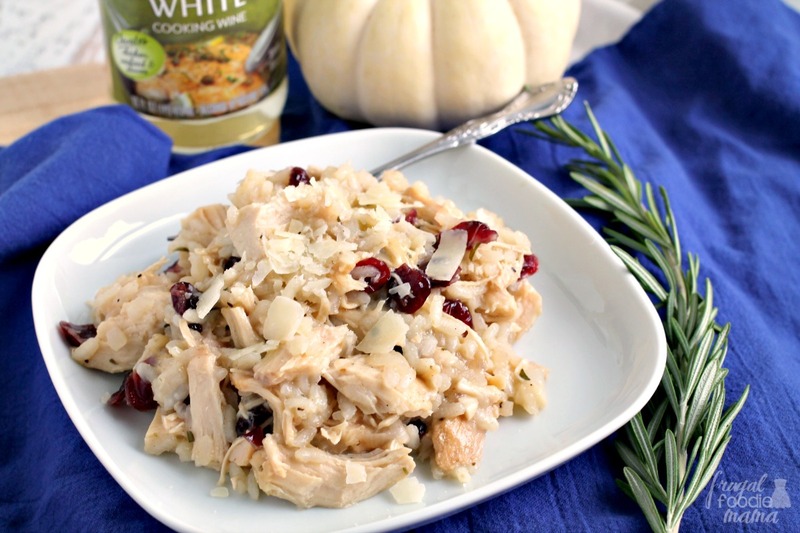 Plus, I love using Holland House White Cooking Wine in this! I love the amazing, bold flavor it imparts to this dish. 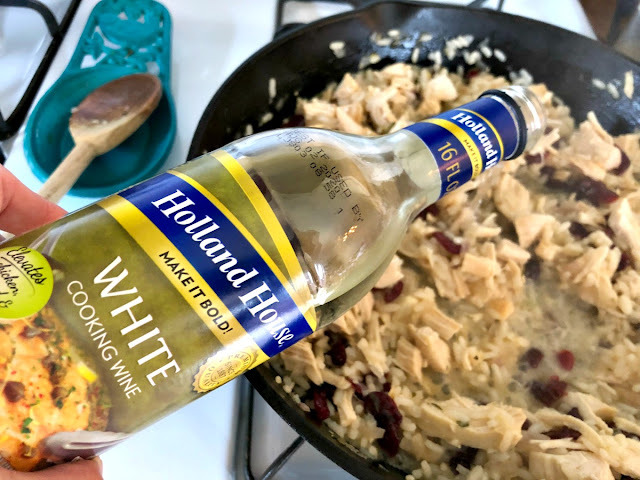 In addition to their white cooking wine, Holland House also offers other tasty flavor boosting cooking wines like their Sherry, Marsala, & Red. 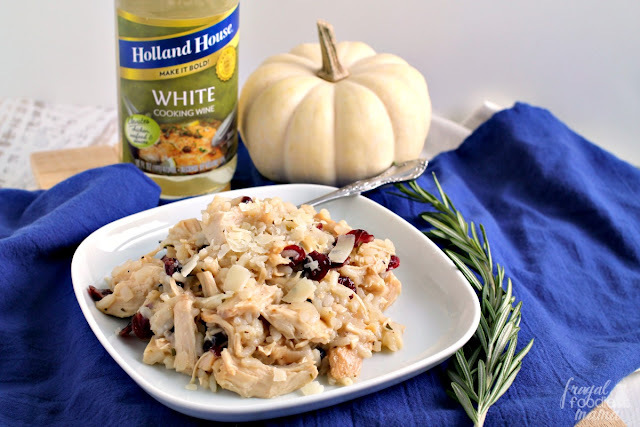 Holland House Cooking Wines are a quick & easy way to add bold flavor to any of your favorite holiday or winter dishes. 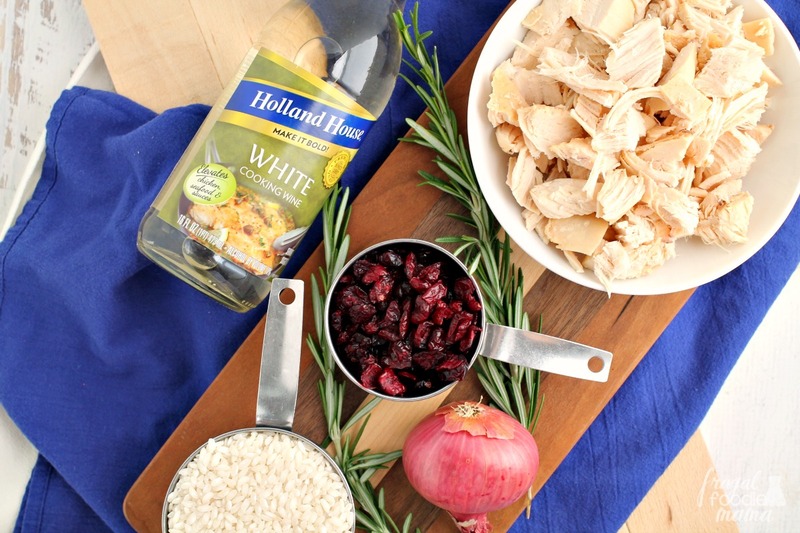 Try the white cooking wine instead of water when making rice. Add a splash or two of the Marsala cooking wine into your favorite chicken soup recipe. Stir a little of the red cooking wine into your favorite pasta sauce for a whole other layer of bold flavor. How will you use Holland House Cooking Wines to take your holidays leftovers to the next level? Bring the broth to a simmer in a medium saucepan over medium heat. Once heated, reduce the heat so that the broth remains warm but not simmering. In a large skillet, heat the olive oil over medium heat. Add in the minced shallot & cook until softened, about 2 minutes. Add in the rosemary, & saute another minute. Next add in the rice & salt, stirring until the rice is slightly toasted, about 1 minute. Stir 2 ladle fulls of the warm broth & a splash of the white cooking wine into the rice mixture. Continue cooking, stirring frequently until the liquid is completely absorbed. Continue adding the broth & the cooking wine in this fashion until both are gone & the liquid has been absorbed. Stir in the leftover turkey & dried cranberries. Continue cooking another 2-3 minutes until the turkey is heated all the way through. Remove the risotto from the heat & stir in the Parmesan cheese until melted. Season with the pepper to taste. Serve immediately with a little additional cheese sprinkled over top. Looking for even more delicious recipes & tips? Then be sure to follow Holland House on both Facebook & Pinterest! And don't forget to visit the Holland House site now to download a redeemable coupon for your next cooking wine purchase!